Marchionne compares integrating Fiat and Chrysler with creating a masterpiece. Fiat-Chrysler CEO Sergio Marchionne says Fiat S.p.A. and its partner Chrysler Group are on the verge of a "unique transformation" after Chrysler on Tuesday repaid U.S. and Canadian government loans that helped to rescue the automaker from bankruptcy two years ago. 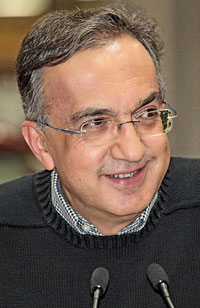 In a letter to Fiat employees, obtained by Automotive News Europe, Marchionne used eloquent language to portray the future of the alliance, using phrases such as: "Giving life to a piece of art is ... a question of inspiration, passion and vision." He said "every painting – even the greatest masterpiece – begins with splashes of color on a canvas," adding that the conditions are in place to consolidate the automakers' industrial integration. I am writing to you all because today is an important day for Fiat, as well as for Chrysler. My best personal wishes to you all as we continue to work toward this worthy goal.